Excess moisture, introduced by way of damp basements and unsealed, vented crawlspaces, contributes to wood rot, mold growth and increased pest activity. Moisture in basementscrawlspaces often migrates to the upper levels of the home through a “stack effect.” In essence, whatever air is below the house is also in the house. As warm air rises and escapes through the upper levels of the home, new air finds its way into the home to replace what’s been lost. Intake air comes in at the lower levels – through unsealed crawlspaces. This may lead to costly problems such as cupping of hardwood floors, crawl space mold growth, basement mold growth, increased air conditioner loads, and swelling of millwork/cabinetry. Air infiltration from the crawlspace or basement often carries odors and may contribute to poor indoor air quality and uncomfortable humidity levels. Excess moisture in basements or crawlspaces has also been associated with contributing to increased energy consumption. Wintertime ventilation cools the crawlspace contributing to heat loss from the home. In the summer, introducing warm outside air under the home contributes to heat gains, increasing cooling loads. Ventilation of a crawlspace to control relative humidity only works consistently in an arid climate. In most climates, ventilation can actually add significant quantities of moisture during humid times. Venting a crawlspace will either add moisture to, or remove moisture from, a crawlspace depending on the moisture content of the ventilation air compared to the desired conditions of the crawlspace. Venting with dry air reduces moisture levels in the space, while venting with moist air contributes moisture. It is false to assume that venting will automatically bring in “good” air and push out the “bad” air. If the outside air is humid and the crawlspace air is humid, you’re not making any improvements by venting. Since venting either wets or dries the space depending on outside conditions, there is no way to guarantee a specific moisture level in a vented crawlspace. The solution to this dilemma is to close the crawlspace. One of the objectives of closing crawlspaces is to reduce sources of moisture entering the space. Even when done meticulously, closing a crawlspace will significantly reduce the moisture but not eliminate it. Active conditioning of the space may be necessary to maintain proper humidity levels. A dehumidifier can provide long-term, active moisture control and ensure humidity levels are maintained at a specific level which is adjustable by the home’s occupant. 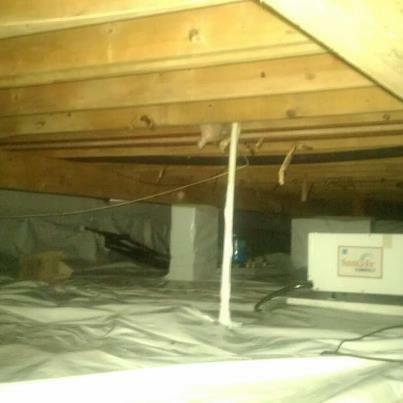 It is important to note the areas of concern when taking steps to responsibly convert your vented crawlspace to a sealed and conditioned space. Those include, but are not limited to: assuring proper water drainage, installing vapor barriers, consideration for combustion and carbon monoxide and sealing outside vents and controlling moisture with a crawlspace dehumidifier. Basement Mold Removal, Crawl Space Mold Removal, Attic Mold Removal, Mold Testing, Mold Inspection, Mold Cleanup, Mold Remediation and Mold Removal in All of New Jersey.